A few years ago, we put out an incredible effect under the name Bill Flash Card. Today, and for the first time on DVD, we’re offering Bill Flash Reverse. Show the card one more time as you unfold it and show it freely front and back, then show your completely empty hands, which the spectators will acknowledge with no hesitation. Slowly refold the card, first in two then again in fourths. 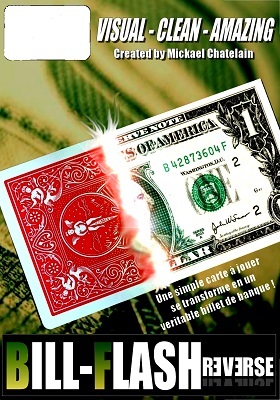 The hiding nothing and in full light, right before the spectators’ eyes, you shake the folded card and then, faster than the blink of an eye, the card is transformed into a banknote, also folded in fourths! Unfold and freely show the banknote — it’s completely genuine, and not just any banknote, it’s a 10 Euro note! How is this possible. You have nothing else in your hands — they’re completely empty! A completely baffling transformation! Where did the card go? Invite your spectator to pick up your wallet. I’ll let you imagine his reaction. The banknote is no longer under the wallet — it has been replaced by a card folded in fourths! Unfold it and show it around. Just as impossibly as unbelievably, it’s the King of Hearts, the very card chosen at the beginning of the trick! Among the most mysterious transformations possible — a perfect close-up effect!